Whenever I eat a scone, I always think I should be drinking tea, and having a tea party. The last time that I made scones, was for Prince William and the Duchess of Cambridge, Kate Middleton's wedding. almost two years ago. How time flies? Obviously, Scones aren't my go baked product to make, like muffins. However, it's about time that I made scones again, right? 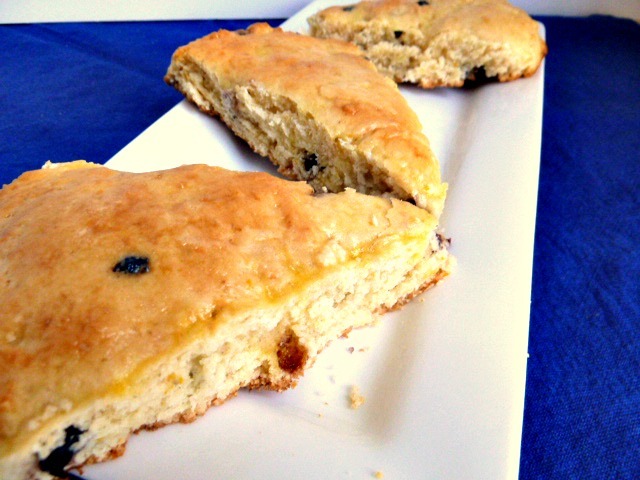 Meyer Lemons are in season now, and I still have a few to use, so I made the Meyer Lemon Dried Blueberry Scones over the weekend. 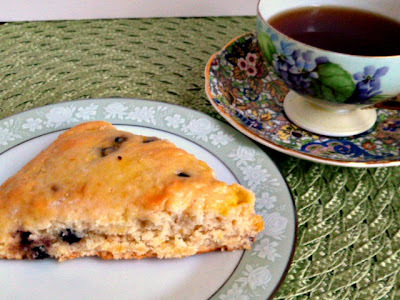 The scones were so good with a lemony, blueberry flavor. The scones are dry on the top, but moist inside with a cake like texture. I gave them an egg wash, before they went in the oven for a nice brown color. My Meyer lemons were on the small size, and I only used the zest and juice of one, and probably should have used two Meyer Lemons instead. I still have another Meyer Lemon recipe that I want to make that needs two Meyer Lemons, (that's a tease.) 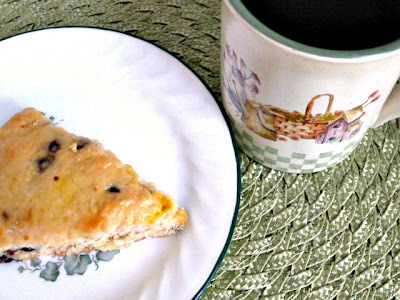 Scones are good with coffee, too, and you can even eat them in your PJ's, if you want. 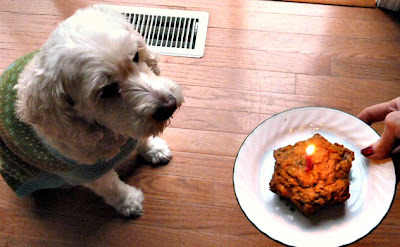 Bailey the Wonder dog turned eight years old on Wednesday, the 16th! Happy Birthday Bailey! I always make her favorite Peanut Butter Banana Cake. Last year she got Pupcakes, and this year she got a huge snowflake. This cake has peanut butter, banana, grated carrots, applesauce, one egg and flour. Of. course Bailey loves the cake, and gobbled it down. What kind of cake will Bailey get next year ? Do you make birthday treats for your Pup? Preheat oven to 400 degrees Make about 8 medium size scones. Mix all ingredients together with a fork, until sticky. Drop by tablespoon on a greased cookie sheet and bake for about 8 minutes, or until lightly brown. Or, for wedges, with lightly floured hands, put the dough in an 8” circle in the center of a sprayed baking sheet pan. Score deeply with knife into 8 wedges. Bake 18-20 minutes. Combine beaten egg and milk or water. Brush tops and sides of scones before baking. Aw Happy Birthday Bailey! What a sweetie! hanks, Raven! Bailey says Happy Birthday to you! Man I love a good scone, especially blueberry...they are my fav! Love the addition of the lemon as well, looks delicious. Thanks for sharing! These Lemon Blueberry Scones are so good, especially warm, with a little butter. Thanks1 these scones are so good! I love scones and make them quite often. Lemon and blueberry is such a wonderful combination. I need to make the scones more often. There are so many varieties to make. thank you! Maybe we should have a virtual tea party? what do you think?